The	Sedona Sizzlers won the championship after defeating Albuqueque 2-1; Phoenix 2-1; one of the Tucson teams 2-1, and the El Paso team 2-1. Their one loss came against the other	Tucson team from Saddlebrook Country Club. With the Sedona team and the Tucson Saddlebrook Country	Club	teams tied with the same win-loss match record,	Sedona won the team championship	because they	won more overall individual matches than the Tucson team. "Every player contributed to winning the championship" said	captain Roberts. "What is remarkable about this team is that only two players had ever had any competitive experience before this	season. Considering the team injuries and learning to deal	with nerves, it was a terrific win and being able to practice at Poco Diablo Resort was big help to us". The Sedona Men's 3.5 Senior League team also competed in the	Southest	Senior	League Section	Championships to finish in 2nd palce with a	4-1 record. The team, named the	Los Poco Diablos,	includes:	Bruce Ullock (captain), Jack Odom, Mark Dzierson, Robert Schuessler, Richard Schumann, Bob Doyg, all of Cottonwood and George Piersall, Tony Dufor, Jack Odom, and Jeff Gloss all of Sedona. Other NAZ Senior League teams that competed in the Southwest Senior League Section Championships:	a Flagstaff, AZ team in the Women's 4.5 Division (captain Chrys Smiley), the Red Rockers from Sedona, AZ in the Men's 4.0 Division (captain Mark Carlson), the Volley Girls from	Flagstaff, AZ	in the Women's 4.0 Division (captain Katherine Baker), and a Flagstaff, AZ team in the Women's 3.5 Division (captain Jan Blackman). 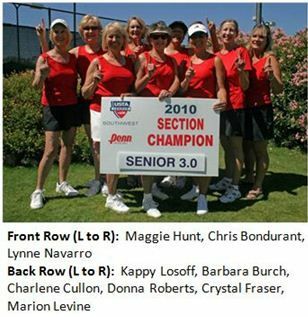 The Sedona Sizzlers will now represent Northern Arizona and the Southwest Section at the	USTA Senior League National Championships to be played at the Indian Gardens Tennis Complex in Indian Wells, CA, October 22-24 where	17 USTA Sections compete for the national title.